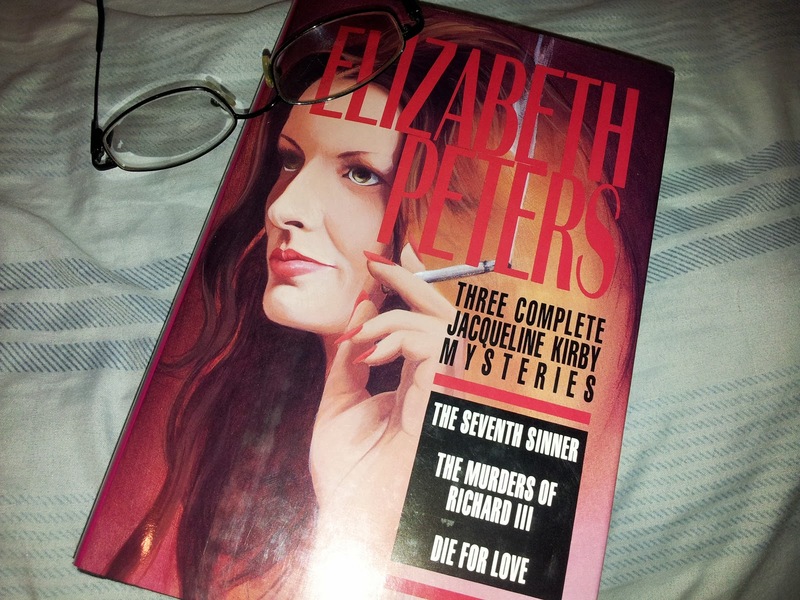 Here we are with this three-book omnibus collection of Elizabeth Peters’ Jacqueline Kirby mystery series. Except now, we're on book two, The Murders of Richard III. For my thoughts on the first book in the series, The Seventh Sinner, click HERE. The Murders of Richard III begins with librarian Jacqueline Kirby strolling through London’s National Portrait Gallery with an old colleague and friend, Thomas Carter. While it’s somewhat fun to discuss portraits and argue with Jacqueline about England’s Parliament, War of the Roses, Lancastrian kings, and Bishop of Bath and Wells, Thomas's true agenda is to arouse Jacqueline to a attend costume party. It's a distinct type of party, populated by a group of Ricardians. (“…not to be confused with the followers of the economist, David Ricardo.”) The Ricardians are a mix of individuals with an interest (or obsession, really) in Richard III and his history. So much so that they gather together for a costume party where each portrays a certain individual surrounding the history of Richard III. And while that may seem all fun and games, the latest truth is that the group has discovered a letter from Elizabeth of York, Richard’s niece. The contents of the letter are to be revealed during the costume party, and Thomas would like Jacqueline to attend as a port of authority. According to him, she’s intelligent, aware, and critical enough to spot a fake; errors in vocabulary, spelling, and the paper itself are clues for Jacqueline. Jacqueline is more or less amused by Thomas’s proposition, but decides to go. 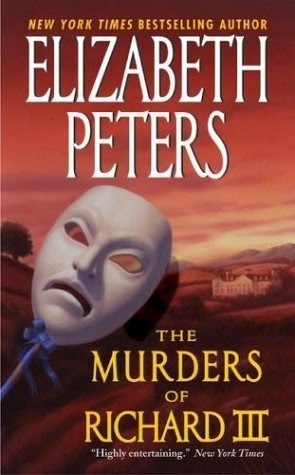 And here begins the English country house mystery where party members of the Richardians begin to experience “accidents” related to their historical characters' respective deaths and murders. So, The Murders of Richard III and how Jacqueline Kirby smokes (both literally and figuratively) her way through solving an old English country house mystery straight out of the golden age of detective fiction. The twist is that this English country house is the setting for a costume party featuring a number of eccentric people dressed as historical individuals once intimate to Richard III of England (of course the host dressed as Richard III himself). And before you even attempt to give Jacqueline's second outing a go, bring a pen and paper to make character notes. Oh, as well as an encyclopedia that covers all subjects pertaining to Richard III, King of England. Why? Because that is where the problems come in. There are over ten–yes, ten–characters/suspects fitted into this tight little country house setting. Each of them come from a variety of different backgrounds. One is a doctor. Another is an actor. You have a family. A beautiful young woman. Oh, a man of religion. A jerk who does nothing but eats. And, well, you might as well consider the Butler. Nonetheless, the list kind of goes on. The issue is that 90 percent of the characters featured in The Murders of Richard III are costumed as historical people. Therefore, they are repeatedly addressed (within the narrative as well as between one another) as not only their real names (sometimes interchanged with their first or last name, which increased the confusion), but also the names of the historical figures they represent. Those names are frequently repeated, and untethered by any comprehensible history for your average reader to take stock upon to differentiate any difference. Furthering the confusion is how some characters even share the names of historical figures–or at least it appears so in some points of the dialogue. Nonetheless, slowly, very slowly, you’ll get the hang of things. Or, like me, your subconscious may automatically kick in and divide the difference for you through a string of mnemonic tricks. Honestly, that’s the only problem I had with the book. I can say that even with the abundance of available culprits, I guessed the correct one immediately after the first "accident". Nonetheless, surprises and reconsiderations were definitely in store as Jacqueline smart-mouthed her way through. And the breakdown at the end, where Jacqueline deconstructs the entire mystery while others stood along to contest her ideas, made me cry out for the ability to produce the same. It was that old-fashioned (in a very good way) and slick of a mystery. And once again, I'm reminded as to why I like Jacqueline Kirby a little more than Peters' most popular sleuth, Amelia Peabody. I'm two books into each series, and I got a feeling Jacquline will shuttle her way in next. Because–like Martha Grimes' Emma Graham–I love these slick-mouthed women in mysteries, I want to highlight some of my favorite moments of Jacqueline Kirby. "Jacqueline was regarding the portrait with a fixed stare. Her horn-rimmed glasses rode high on her nose, but she had left the rest of her tailored working costume at home. She wore a short, clinging dress of her favorite green; the short sleeves and plunging neckline displayed an admirable tan. Tendrils of bronze hair curled over her ears and temples. Without turning her head, she spoke. The voice could not by any stretch of the imagination be called mellow." Nope. Jacqueline is hardly ever mellow. "'Okay, I guess I've got them sorted out. Thomas, do you realize what this is? It's an English house party, darling, straight out of all those British detective stories I revel in. These people are classic characters. They couldn't be better if you had invented them. The doctor, the vicar, the village squire; the catty middle-aged hags and the sulky, beautiful young heroine, and the two juveniles–homely and nice, handsome and rakish. This is one missing. But I suppose it would be too much–'"
Jacqueline, always regarding people and situations with an honest observation. 'You wouldn't dare...' Percy stood up. She rose and advanced purposefully on Percy, who proved her point by retreating, at full speed, and without further comment." As seen, Jacquline is not one to play with. Jacqueline even teaches readers how to write detective fiction. So much more to share. But I'll leave that up to you.